I admit that I’m obsessed with strawberries. Even though we subscribe to a CSA that provides 3 baskets every week, I’m often at the Farmers Markets buying more. In mid-strawberry season, the (refrigerator) shelf life of strawberries seems shorter than that of early-season berries, despite storing them for longevity. Sometimes they have surface blemishes and oddities. For this we have recipes. 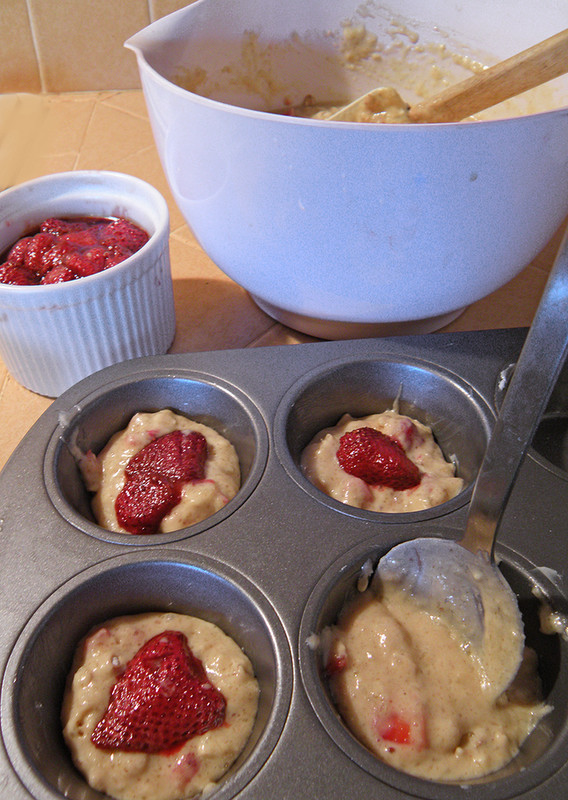 This recipe is adapted from a fellow CSA member at Live Earth Farm, who brought strawberry muffins to the annual summer solstice celebration. The baker left the recipe, but not his or her name. This recipe originally called for 2 cups of chopped strawberries instead of the chopped berries in the batter plus balsamic berries layered in between. So if you’re in a hurry, use 2 cups of chopped berries and eliminate the layering with roasted balsamic berries. 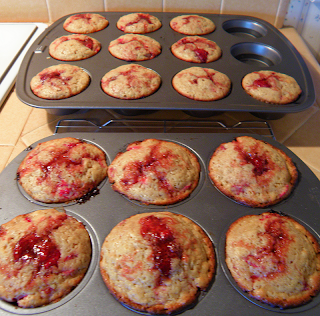 Of course, they’ll be just Strawberry Muffins, not Double Strawberry Muffins. The roasted balsamic strawberries inside are a cross between jam and a large cooked berry, and add a surprise element since they’re largely invisible from outside. Roasted balsamic strawberry recipe, and the idea of using them in muffins and cakes are from my last post, adapted from recipes by White on Rice Couple and Joy the Baker. Although both of these bloggers suggest using 2 tbsp. oil for 1 lb. of (to be balsamic'd) strawberries, I’d try using 1½ tbsp. next time if I were making these muffins. I also reduced the amount of butter in the original recipe from ¾ cup. 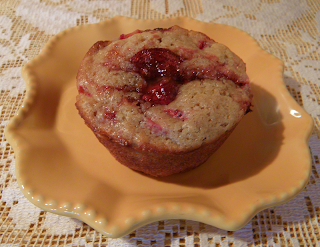 Please post a link or recipe if you have other ideas for strawberry muffins. ‘Tis the season! Preheat oven to 400 degrees F. Grease or line 18 regular size muffin cups. Mix together flour, rolled oats, sugar, baking powder, salt, and cinnamon. Set aside. Mix together beaten eggs, milk, cooled melted butter, and vanilla. Combine wet and dry ingredients until just moistened. Don’t overmix. Gently fold in chopped strawberries. 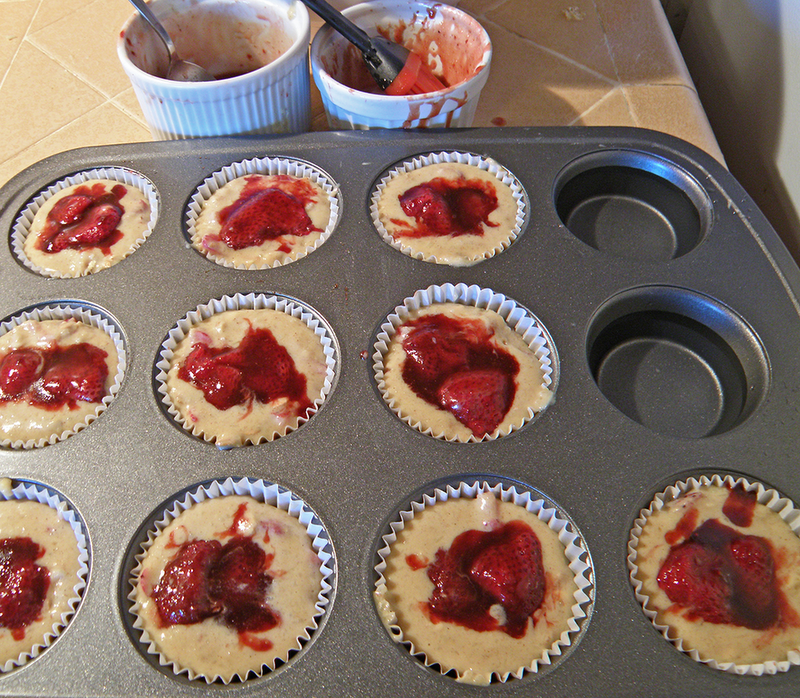 Put a spoonful of batter in muffin cup. Top with a balsamic roasted strawberry or two. 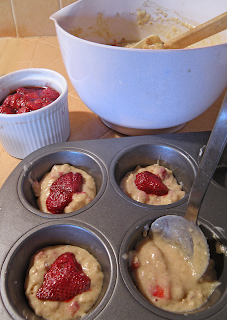 Add second spoonful of batter to fill muffin cup till almost full. Top with balsamic roasted strawberry. Fill all muffin cups, then brush tops with roasted strawberry liquid. Bake for 15 – 17 minutes, until toothpick inserted in center comes out clean. Remove from pans and cool on wire rack for 10 minutes. I LOVE this recipe. It's so easy, and my family loves it!